Okay, you really have to read that title thinking of the old A&W commercials and the Rootbear who'd tromp around to the cute music. I used to love singing that little tune - ba-dum, ba-dum, bum ba dum ba dum dum. Ba da da dum, da dum da dum dum ... even learned to play that one on the pedals of the organ lol! So why am I thinking of this old song right now? Well, we've got rootbeer on the brain. Yup, the cook's back in the kitchen because the new stove arrived (and works great!!). Introducing the Rootbeer cupcake! This cupcake starts with rootbeer chocolate cake topped with rootbeer buttercream, grated chocolate, whipped cream and just a few sprinkles .... What's best about it is it's not quite as sweet as most cakes (the rootbeer cuts the sugar flavour a bit), so it's easy to eat more than one! Well, it seems like awhile since we've posted on here! Summer has been a blur of activity - amidst trips to the lake, entertaining company and working we did cupcakes for two weddings, a trade show, and numerous others. Now that September is upon us, it should be time to get back in the kitchen making some creations. But, wait, is it possible that we could both be without an oven right now? You guessed it! One kitchen is undergoing a renovation and the other has suffered the loss of an oven! Hopefully the new one will be here in the next couple days so we can get back to concocting some new fall delights. So, rather than baking, we'll be dreaming of some fun fall flavours to unveil. This time of year always makes me think of apples, maple syrup, cinnamon and nutmeg. What do you crave as the days get shorter, the temperatures fall and the leaves start to turn? Summer is such a fun time of year! The days are longer, the sun is warmer, the colors are brighter and there's a holiday each month! We've got one of my favourite holidays coming up next week - Canada Day. To me, July 1 is an opportunity to remember the wonderful things about our country and to appreciate all that we have in this beautiful nation. I proudly wear red & white to enjoy the festivities! And, with that holiday on my mind, I came up with a patriotic cupcake - the Red & White. It's a Red Velvet Cola cupcake with rich buttercream frosting, drizzled in a red raspberry sauce and sprinkled with red sprinkles. Oh, Canada!! And, here's a twist on the Pink Lemonade cupcake - for those of you who aren't so into the pink! It's Green Limeade! This is a light & fluffy lime cupcake with lime frosting! A sprinkle of green and a lime candy finish it off. I suppose we could add a little sumthin-sumthin to this to make it a margarita cupcake ... whatever your heart desires!! We were invited by Kara of Polka Dot Piggy to do a show at Lakeshore Garden Center with a select group of vendors. So we headed off on a very rainy Thursday to set up our delightful cupcakes for the evening. We brought a couple favorite flavors - Paralyzers & Orange Creamsicles - and a few new creations! Shown here with the Paralyzers and Creamsicles are the Raspberry Ripples - a raspberry cream soda cake with a touch of Raspberry liqueur in the frosting! Introducing Chocolate Orange and Yo-Ho-Ho (and a bottle of Rum) - Rum Raisin! Yo-Ho-Ho does have rum in it (the raisins are soaked in it and the frosting infused with rum), but not quite a bottle like the name would infer!! Chocolate orange is a delightful chocolate and orange cake with orange cream cheese frosting ... mmmmmmm. And, here we have the Mocha Joe cupcake - a coffee-chocolate cake with coffee buttercream ... an instant pick-me-up! And, a great choice for coffee breaks on dreary days! A delightful evening and another sell-out! A very special thank you to Kara of Polka Dot Piggy Designs for inviting us along and coordinating the event. There's a possibility of it happening again ..... you won't want to miss it! A friend's daughter is turning 5. What a fun time for a little girl! She's having a Hello Kitty birthday party and wanted pink and white cupcakes for it. We've been thinking of a raspberry cake for awhile now and were waiting for nicer weather, but frankly got tired of waiting! Perhaps the creation of a raspberry cupcake will bring on the summer weather! So, mother nature, we present you with a beautiful raspberry cream cake and raspberry buttercream frosting. Will you please return the favor and delight us with some sunshine? I had a request to create a cupcake for a shower where bride's colors are black, white and green. It seems that green is a popular color right now and that naturally made me think of our green Riders. Since the Riders are "simply the best," I had to start with simply the best cupcake base for this - a chocolate chunk brownie! Topped with decadent cream cheese frosting streaked with green and drizzled with chocolate glaze. A few green sprinkles just finish it off. Care to weigh in on whether green is your favorite color? Another rainy day brought on another baking creation! 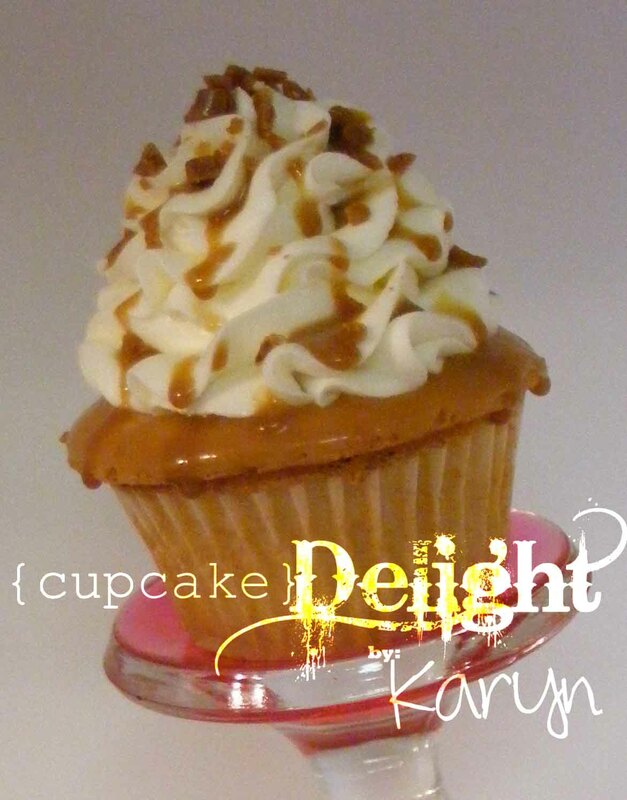 Introducing the Captivating Caramel Cupcake - made with caramel lovers in mind!